If it were not for his wife's persistence, this book - which is one of the all-time bestselling self-help titles and made Norman Vincent Peale a founder of the human potential movement - may never have been published. He was in his fifties when he wrote it, and had received nothing but a stack of rejection slips. Dejected, he threw the manuscript into the wastebasket and forbade his wife to remove it. She took him literally, next day presenting the manuscript inside the wastebasket, to the successful publisher. The book has sold around 20 million copies in 42 languages. Along with How to Win Friends and Influence People and Think and Grow Rich, it is one of the original 20th century self-help classics. These are not the ideas of someone with an unrealistic take on life, offering escape. Peale saw plenty of human misery in his daily life as a minister in New York City, but he was not content to provide a weekly sermon; he wanted measurable change in the life of people he met. Over many years, he created a 'simple yet scientific system of practical techniques for successful living that works', tested and refined among thousands of people in and outside his ministry. And like Carnegie with How to Win Friends and Influence People, Peale ran the ideas as an adult course long before they were distilled into book form. Peale's theme is that we don't have to depend on ourselves; there are incredible sources of power open to us if we only believe in their existence. We make life hard, but an appreciation of the universe's ability to make good and to provide would lead us to see life as flowing and abundant. Life seems difficult because we only believe in ourselves. He expresses the great secret of self-help that, in order to gain personal power and peace, we have to be willing to go beyond the merely personal to something greater than ourselves. 'How to have constant energy' Peale reveals the secret source of energy of every great person he has known: attunement with the Infinite. The knowledge that what one is doing is supported outside oneself and is serving a divine end, provides a constantly renewable source of energy. Working only by oneself and for oneself leads to burnout. 'Try prayer power' Prayer is different to what you thought it was. It is a space to say whatever is on your mind, in whatever language you choose. Instead of asking for things, give thanks in advance for what you desire, leave it in God's hands, and visualise the good outcome. The Peale formula is 'Prayerize, Picturize, Actualize'. Be surprised at its effectiveness. 'New thoughts can remake you' Use only positive and hopeful language for a 24-hour period. Then go back to being 'realistic' the next day. Repeat this over a week and you find that what you considered realistic a week ago now seems pessimistic. In golfing terms, discover that 'the rough is only mental'. Your new understanding of what is realistic moves up to a higher, permanently positive level. To really appreciate The Power of Positive Thinking you have to understand its background. Peale came from plain Mid-Western stock, and he believed he was writing, in his words, 'for the plain people of this world'. Most readers will find it quaint or amusing because the language conjures up simple church-going folk in the 1950s. It might be old-fashioned, but only a cynic would find it totally redundant - the book's principles are easily applied from its original time and place to your life, as you would expect of a classic. It is refreshing because there are no gimmicky techniques; expect to find only a bag of well-worn tools for chiselling away cynicism and hopelessness. And although it has things like a 'prayer for salesmen', it is something more than a hotchpotch of Christian and capitalist morals. Consistent with most of the self-help classics, it says that the highest morality is fulfilment of potential; to 'give up' is to deny yourself all spiritual and material rewards rightfully yours. 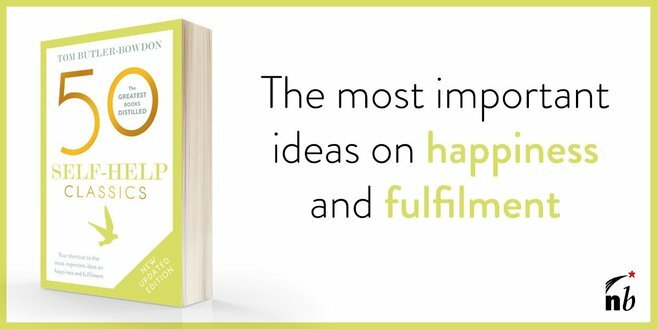 There is an unassailable logic to Peale's book that if you're feeling down, can forcefully restore life again and again, clearing all doubt from the mind. "Doubt closes the power flow. Faith opens it." Himself the son of a Methodist minister, Peale was born in Bowersville, Ohio, in 1898. Following college (Ohio Wesleyan University) and work on newspapers (Detroit Journal), he enrolled at Boston University School of Theology. After ordination he quickly became a popular preacher who could swell congregation numbers tenfold. During his time at University Methodist Church in Syracuse, New York, he met and married Ruth Stafford, his life-long partner and collaborator. At age 34, Peale moved to Marble Collegiate Church in New York City, where he stayed through the Depression and World War Two until the early 1980s. His sermons became so well known they attracted tourists. In the 1930s he also began a radio broadcast, 'The Art of Living' that was to be heard weekly for 54 years, and established a clinic of Christian psychotherapy with psychiatrist Smiley Blanton, later the American Foundation for Religion and Psychiatry. In 1945, Peale established the inspirational magazine Guideposts which is still popular. He was sometimes criticised by fundamentalist Christians for his liberal understanding of Christianity and embrace of other faiths. Politically, he was conservative: he travelled to Vietnam at President Nixon's request and was given the Presidential Medal of Freedom by Ronald Reagan. Peale wrote over 35 books after Positive Thinking, and was a prolific speaker; he was still addressing around a hundred groups a year in his nineties. He died on Christmas Eve, 1993, aged 95, but the Peale Center in New York State carries on his work. Peale's life has been chronicled in Carol V R George's God's Salesman: Normal Vincent Peale and the Power of Positive Thinking.